How Can I Help? 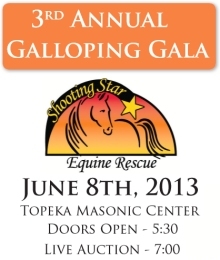 | Shooting Star Equine Rescue, Inc. Become active in your own community by helping to educate those around you and offering your time, energy and financial support when possible. Encourage responsible ownership of all animals. Volunteer at a Horse or animal rescue near you. Support rescue efforts by purchase of items, donations, or attendance at community events. Adopt your horse or animal companion through a local rescue or humane society.